Synopsis: Con artist partners Iriving Rosenfeld (Bale) and Sydney Prosser (Adams) are forced into working with FBI Agent Ritchie DiMaso (Cooper). Together they target and con people such as corrupt politicians to ensure Rosenfeld and Prosser do not run into trouble with the law. Review: 1970s America, a place with jazziness and interesting fashion styles. Mixed in with all this are con artists, an FBI agent and some corrupt politicians. 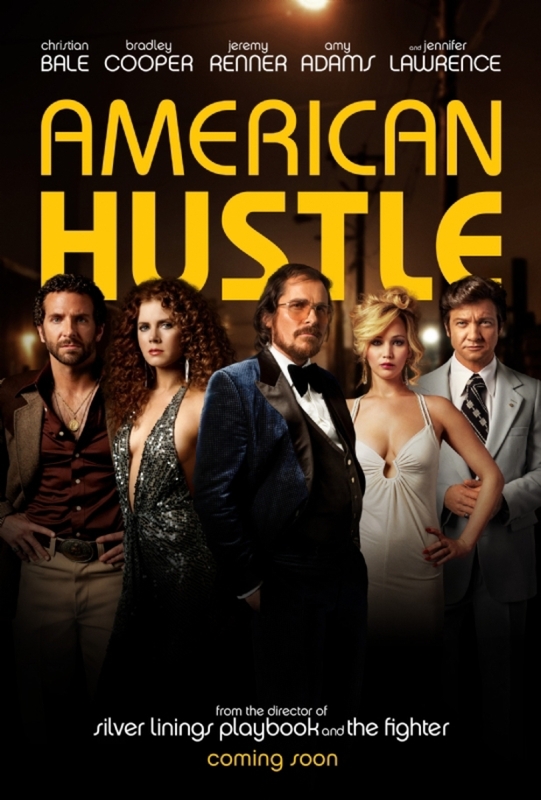 As the film’s tagline reads “everyone hustles to survive” In that we get a very enthralling and complex story with people hustling to make themselves a living, by any means necessary. A funny caption at the start of the film eludes to the fact that the film’s events are based on a true story, although some details may be fictitious. The ensemble of Christian Bale, Amy Adams, Bradley Cooper, Jeremy Renner and Jennifer Lawrence were all fantastic in their roles. Russell seems to know how to get his actors to perform to their full potential. He worked with Bale and Adams on The Fighter and with Lawrence and Cooper in Silver Linings Playbook. In both of those films the actors were people who were a bit crazy but it worked as Bale and Lawrence both won Oscars for their roles in those films with Cooper and Adams receiving nominations. Again he finds roles for these actors that suit them perfectly and everyone was on top form. The dialogue between them was a joy to behold as it felt so natural between each character It has come as little surprise to see that the performances of Bale, Adams, Cooper and Lawrence have all been recognised as the four are all nominated for Oscars once again. Bale and Cooper for Best Actor and Supporting Actor respectively and Adams and Lawrence for Best Actress and Best Supporting Actress respectively. The dialogue between the characters was so intriguing and fascinating to watch. What is happening on screen keeps you glued to the screen as you watch their schemes unfold. As you watch the film run from scene to scene it never slows down and remains entertaining throughout. Special praise must go to Jennifer Lawrence who just continues to have incredible success. The Hunger Games franchise may have shot her to super stardom and into the hearts and minds of just about everyone. However, her roles under the guidance of Russell show just how versatile she is. There is one scene with her and Amy Adams in the ladies’ bathroom which just leaves you taken aback by her brilliant acting. In spite of the fact that everyone did a stellar job in their roles, Lawrence definitely stole the show and a second Oscar could definitely come her way. Although the plot does keep you entertained throughout the film’s running time, a lot is happening that may cause confusion for viewers. The scam that takes place is complex that it is at times not entirely clear who is conning who. You think that person is being conned, but at the same time you wonder are they being conned? The dialogue ensures the audience is focused but they may have trouble keeping up with what’s going on. In spite of this confusion the film was a very entertaining film that kept the audience engaged throughout whilst at the same time maybe scrambling their brain cells a little bit. David O Russell is again on top form with the directing and execution with brilliant acting from the ensemble cast. The leading ladies both bagged Golden Globes for their performances whilst the film scooped the Best Motion Picture for a Musical/Comedy. Furthermore there is a great chance the film could add one or two Oscars to its neat collection of awards. Tremendously well acted with a terrific script and solid direction from Russell, one of the funniest movies of the year.